Both server and client need to have the mod installed. "Antique Atlas" is a craftable item that enables a special map screen. You can navigate the map via click & drag, zoom via scroll wheel. 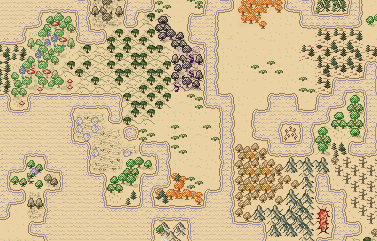 Additionally, on-screen buttons let you add/remove/hide markers, export the map to an image file. There is now a minimap that is enabled by default if you put an Atlas into the off-hand slot. To disable it, go into Mod Settings for "AntiqueAtlasOverlay". As of this writing (2018-06-02), when you export the image file, it will be in PNG format, and contain a map of the dimension the player is currently in. This mod initially started as a spin-off from a (discontinued) mod project Quest, it was inspired and improved by ideas from the team. For more Quest-related stuff check out Zelda Sword Skills by coolAlias! His mod also uses Atlas API to mark Boss Dungeon locations. Make sure to use the appropriate download of Antique Atlas that says it is compatible with ZSS! New in v4.2.4: various settings can be tweaked in Mod Settings (or .minecraft/config/antiqueatlas/settings.cfg). If you experience lag spikes or slow loading of chunks, try disabling do_scan_ponds and do_rescan. Modders can make use of the Atlas API! Crafting an Atlas with empty Atlases creates clones of the original Atlas. Map content is shared between the clones, so you can always leave a copy at home and go on adventures without ever worrying of losing your Atlas. 2 different Atlases can be crafted together and have the contents of both merged into a new one. Right-click while holding the Atlas to open it. A huge thanks for various contributions the mod! to everyone who made suggestions in the Minecraft Forums thread. They have been really insightful, and some of the suggested features have been implemented. Golrith's colored texture pack! Supports Biomes O'Plenty and Thaumcraft! A gigantic thanks to Golrith for making this one! Apologies if this is an old version, you can ask Golrith for updates. Offers a revamped and colored style for the Atlas (except mesa/icy biomes) as well as custom textures for the biomes from Biomes O'Plenty and Thaumcraft. 1. Copy the file "AntiqueAtlasExtra.zip" from the archive to the folder ".minecraft/resourcepacks"
2. Launch Minecraft, go to Settings > Resource Packs and enable the resource pack "Golriths Anqitue Atlas". 1. Replace the file "texture_sets.json" in the folder ".minecraft/config/antiqueatlas" with the one in the archive. 2. Similarly replace the file "biome_textures.json" or manually edit it using a text editor to copy the lines which correspond to the custom biomes from the file "biome_textures.json" in the archive file. 3. Make sure that biome IDs in this config match the actual biome IDs in use in your BoP/Thaumcraft installations. You can use NEI to do a biome ID dump. Change the biome IDs in your "biome_textures.json" accordingly so that they match their intended textures. Is there a way to make this compatible with the Corpse (https://minecraft.curseforge.com/projects/corpse) mod so it places a marker where I die? This mod looks absolutely phenomenal, but I have one question: Does it support mods that add new biomes other than Biomes o’ Plenty, such as Traverse and Oh The Biomes You’ll Go? It looks fairly simple to add support for them, applying existing map textures to biome IDs. But no, the only files I've seen so far are for BoP (several of those), TC (Thaumcraft), and something referred to as NC (that I haven't identified). What happens if I use Antique Atlas with mods like that? It’ll still work, right? Will it just produce generic biome textures? Every biome has a list of tags, like "hot", "arid", "swamp". AA will read those tags and try to find a fitting texture. It may or may not the best choice, but it will work. And you can override the defaults in the config. Your "Known bugs" link in the description is outdated. It should point to this. No, thank you. Amazing what you people threw together here. Can u make supporot for AA, BoP and TC for 1.12.2? The customs biomes are still not working. For custom biomes: The png files in the ressource pack needs to be lower case. Then the texture_sets.json needs an update too. Did you replace with lowercase file by file, or as a batch? So there is a Sign Post mod and I thought sweet. Our Train stations we make overtime when a player goes by a marker, etc will be added. Then I found out it's just fast travel haha..
Is there a mod or something where a player can build some sort of in game sign where if you load the area it auto adds it to AA? That would be really cool being able to actually show some sort of train station, and other unique markers that auto populate without the player having to add them in themselves. 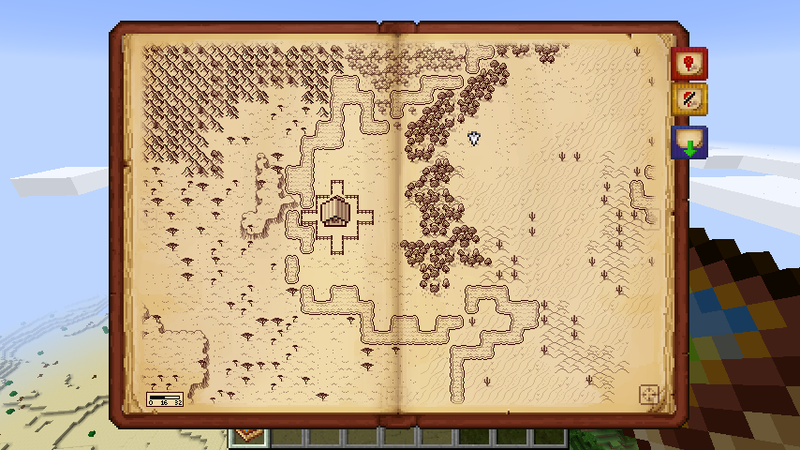 So, I'd assume it shows the map of the world simply based on the seed. Do all maps do this? Because that would mean custom generated maps wouldn't show up correctly. It's based on the average biome of the world's tiles. custom generators should work. Since this mod has icons for villages, nether fortresses etcetera, does it work for structures from other mods like Quark? From what I can tell, you can configure AntiqueAtlas to automatically mark villages. But I don't think fortresses etc get marked unless you Add a marker manually. Therefore, yes, you can use AntiqueAtlas to mark structures from other mods, once you wander into them. I've been using a small red X for misc points of interest like herds of horses and packs of wolves.